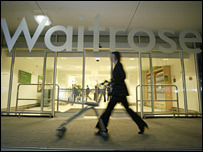 More than 100 jobs are going with the closure of a Waitrose supermarket in Durham, which opened in November 2005. The company said it did not make the decision lightly but blamed the move on the store's failure to make a profit. The firm, part of the John Lewis Partnership, bought the Gates Shopping Centre site from Morrisons in 2005. A spokesman said it was hoped some staff could be relocated to a new store due to open in Newcastle in the summer. The planned store for Newcastle,is part of a £170m revamp of the city's Eldon Square shopping mall. It will create up to 100 jobs, the company added. Mark Price, managing director of Waitrose, said: "Eldon Square offers us another exciting opportunity to grow our business and underlines our desire to bring the Waitrose offer to more people in the North East. "The decision to close our Durham branch was not a decision we took lightly, and was made after long and careful consideration. "We made a major investment in the Durham branch with every expectation that the shop would be successful. "We understand the disappointment this decision will cause, however, the store has traded at a loss since we opened two years ago."